ADVA Optical Networking is the latest vendor to unveil a purpose-built platform for data centre interconnect (DCI) with the launch of the ADVA FSP 3000 CloudConnect. ADVA is no stranger to the data centre market, having had customers in this space since the day the company was founded, according to Jim Theodoras, its senior director of technical marketing. But he acknowledges that the pace of development is such that a new product was needed. “Things are getting very competitive. Certainly the needs are changing and so we’ve come up with a completely new product,” he said. The ADVA FSP 3000 CloudConnect has been engineered in close partnership with Internet and cloud service providers to ensure that the platform meets the stringent density, scalability and energy demands of this particular group of customers. The end result is a platform that can transport up to 25.6Tb/s duplex capacity per fibre pair from a single rack, delivering 51.2Tb/s of total throughput from a density of 1.4Tb/s per rack unit. Power consumption is less than 500mW per Gb/s. The platform also includes amplifiers, multiplexers and all other necessary components – a first for the industry, according to the company. “The metrics are at least two times better than any of the products out there to date,” claimed Theodoras. The new platform is available in several configurations to suit different types of customer, including a 4 rack unit (RU) 450-mm deep chassis and a 12RU, 300-mm deep version. 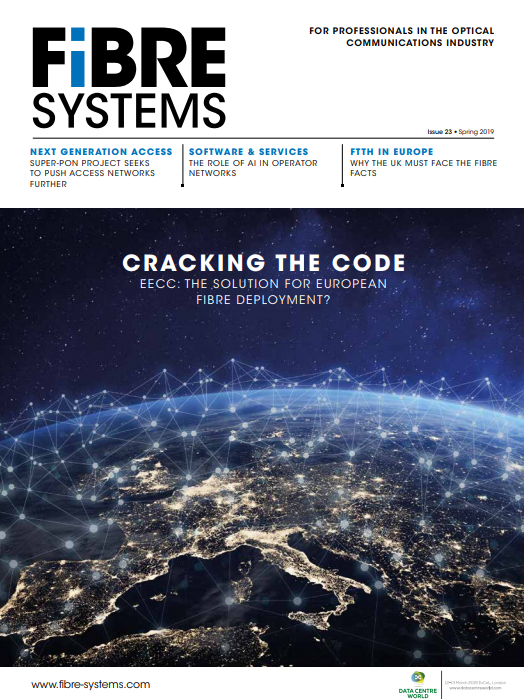 The former is designed to meet the requirements of the new cloud operators, while the latter is better suited to more traditional European data centre operators, who still form a significant part of ADVA’s customer base. Theodoras says the 4RU form factor was chosen because it is “still small enough to still fit into those colocation slots that are very space constrained, but still big enough that you can scale much longer before you break out of one chassis.” ADVA considers this to be the ‘sweet spot’ in terms of density. “We had one customer go to their ops team and they couldn’t find any installation in North America where four won’t fit but one will. That took us down the 4U path,” he explained. To boost capacity ADVA moved to a 37.5-GHz channel plan, thus squeezing in more channels – reaching up to 188 channels and 25.6Tbps in the C-band. If the customer desires, more wavelengths can be added in the L-band, increasing capacity up to 50Tb/s per fibre pair – or more than 100Tb/s of total throughput per fibre pair. The CloudConnect also features what ADVA claims is the industry’s first true 400Gb/s single line card, providing 800Gb/s of aggregate input-output capacity in a single slot. To reduce power consumption by about half compared to its competitors, the FSP 3000 CloudConnect is a modular platform that eliminates electrical connections between cards. Data centre operators don’t need the switching functions of an active backplane, since those functions are already being performed by the switch or router before it gets to the optical transport box, Theodoras explained. “In this space, power is king,” he said. One final point that ADVA emphasises is the platform’s open architecture, which supports a wide range of customisable APIs for programmability, no matter the size or architecture of the underlying network. From simple point-to-point networks, to meshed networks, to global-scale virtualised networks, software integration is effortless with CLI, REST, NETCONF, and RESTCONF all supported, the company says. For advanced virtualized and multi-tenant networks, a network hypervisor with fully open northbound interfaces is available to abstract the DCI transport network so that end-to-end optimisation of multi-layer packet flows is possible. ADVA expects the CloudConnect to be generally available by the end of the year.